January 21st, 2017: Ryan Miller (@ermillertattoos) will be returning to guest spot with us January 31st and February 1st! Check out his work! 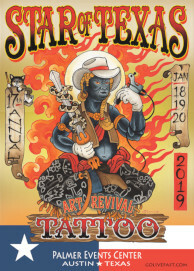 January 18th, 2017: Depiction Tattoo Gallery will be returning to the 15th Anniversary Star of Texas Tattoo Art Revival! January 27 - 29th at the Palmer Events Center. Christmas Toy Drive and Open House Party! December 3rd, 2016: JOIN THE EVENT: Saturday, December 17th starting at 12pm we will be collecting toy donations for ACH Child and Family Services. All donations will be rewarded with a $25 shop gift card! Limit one gift card per person. October 25th, 2016: Ryan Miller (@ermillertattoos) will be returning to guest spot with us November 8th-12th! Email depictiontattoos@gmail.com if you are interested. July 29th, 2016: Ben Ochoa (@ben_ochoa) will be joining us for a guest spot August 25-29th! July 26th, 2016: TAG YOUR COLORADO FRIENDS! Sam (@sami_lynne) will be at Dedication Tattoo (@dedicationtattoo) July 26-30, for a guest spot! July 26th, 2016: TAG YOUR COLORADO FRIENDS! John (@johnclarktattoos) will be at Dedication Tattoo (@dedicationtattoo) July 26-30, for a guest spot! July 20th, 2016: Sam (@sami_lynne) will be doing a guest spot at Old Crow Tattoo in Oakland, California July 20th-23rd!